It means electricity and gas used in the evenings could cost 99 per cent more than at other times — penalising everyone cooking family meals, watching popular TV shows and heating their homes on chilly winter evenings. Higher charges will also apply in the morning when people are most likely to be taking baths and showers and having the central heating on. And we have uncovered evidence that smart-meter schemes unveiled in other countries have proved a disaster, with complaints about soaring costs and an outcry over invasion of privacy. Mark Todd, marketing director at price comparison site Energyhelpline, says: ‘My fear is that government could be complicit in a scheme that enables suppliers to try to reduce demand at peak times by upping costs. According to the government, “Time-of-use tariffs will mean the option to use energy at a time when it is cheaper.” Can you see the deception here? If you don’t want to pay a higher rate for electricity when you normally would need to use it, you have the ‘option’ to shift your usage to a time when you don’t need to use it. What sort of ‘option’ is that? Unlike commercial customers, residential consumers have little electrical load that they can successfully shift to so-called ‘off-peak’ periods. Even if they do shift some usage to the middle of the night, they still have considerable ‘base load’ which is subject to the higher peak rates, resulting in an overall higher energy bill. Many vulnerable members of society are particularly hurt by TOU rates. Elderly people, stay-at-home parents, and those consumers using life-giving medical equipment should not be subjected to rates which penalize them for using electricity during the day. Money that is ‘saved’ by somehow shifting usage to the middle of the night results in a lower quality of life and cannot be considered a benefit. Because of the above, utilities should continue to offer electrical service to residential consumers at a fixed rate. It is the ‘fairest’ and simplest way to do business. The developing trend towards TOU electrical rates in antithetical to the trends of other utility-related industries. For example, it use to be that long-distance phone call rates were much higher during ‘peak’ times. Years ago it was common for family members to call relatives late at night or on weekends. These TOU-type rates have all but disappeared. Electric utility companies need to price their service to customers at a fixed rate that considers the fact that wholesale prices may change somewhat through the course of the day. There is no need to subject the customers to these price signals and to consequently negatively affect their lives. For the utilities, it is just the cost of providing an essential service to consumers. If they don’t like offering consumers electrical service at a fixed rate, then they shouldn’t be in that business. Home energy efficiency improvements can truly reduce consumer usage of electricity. Consumers can purchase LED light bulbs and energy-efficient appliances as examples. You don’t need a ‘smart’ meter or TOU rates to know that these efforts will be successful in lowering your energy bill. 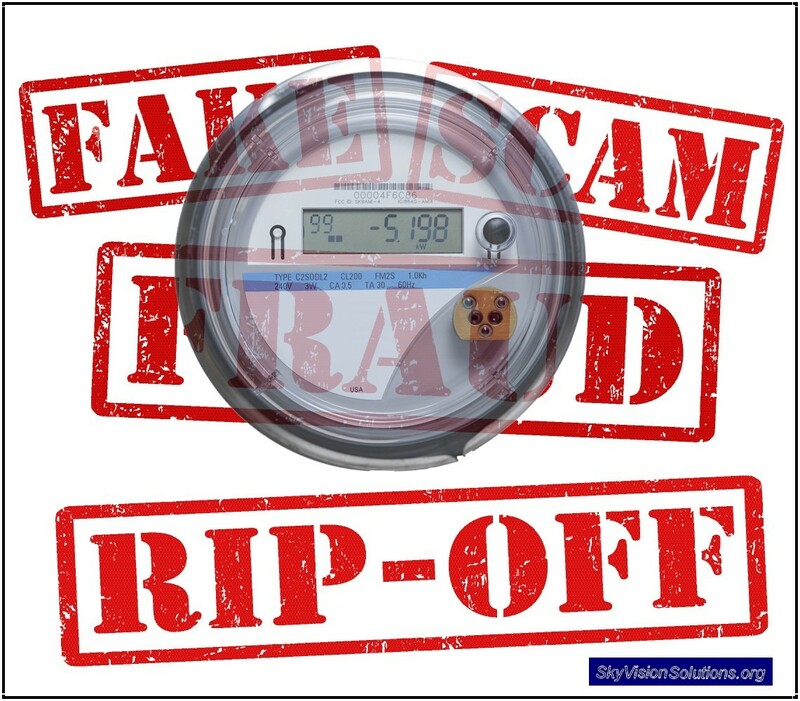 ‘Smart’ meter deployments are just a giant consumer ‘rip-off ‘ and a fraud. This entry was posted in Smart Grid, Smart Meters, and RF Emissions and tagged Consumer Rip-off, Costs, Smart Meters. Bookmark the permalink. There is no need to subject the customers to these price signals and to consequently negatively affect their lives. For the utilities, it is just the cost of providing an essential service to consumers. They as you call them will not WIN, if you follow the advice below and do not allow THEM as you call them to win. Here’s the REMEDY for you all to WIN ! I and many thousands of us in Victoria Australia have padlocked our privately owned home Electricity boxes and our water meters and our gas meters so that these I allege to be truly Extortionate three companies for Electricity and Water and Gas cannot steal these passive Analog metering machines from you. I sent a polite but Stinging letter of REBUKE to the C.E.O’s of these corrupt and extortion demanding money companies and their lawyers and their Human Services Department. Nay their actually INHUMANE Services Department here in Victoria Australia as had many thousands of others outraged people, just like me at these Electric and Water and Gas companies who are in effect stealing off us their customers. For me and others who have padlocked our three Analog water, electric and gas meters we are not being ripped off so far, and this goes back to 2011, as they these I allege to be THIEVES cannot fiddle with Analog Meters now padlocked since 2011 and in secure metal boxes with a small flap to lift up to get the Analog Meter Readings. I also sent with my polite and ‘Stinging Letter of rebuke’ to the Electric Power Company a special A.C.C.C. Notice of Fine for Ten Million Dollars $10,000,000 fighting their IDIOTIC phone-calls and their LYING LETTERS, stating that it was the LAW that the people in Victoria Australia had to abandon the trusty Analog Electric Meter and allow these now proving to be Type 2B seeming to be Carcinogen Causing Electric Microwave A.M.I broadcasting and receiving machines on their privately owned home and or small business properties. This is in effect TERRORISM by the Electric Power Companies or the water and or Gas Companies by these three I allege to be WICKED and Extortionate Companies. There is no LAW to force the Safe and non-cheating Analog Meters from people here in Australia or any of its states. It is only a MANDATE and an Order in Council which has no LAWFUL TEETH AT ALL. Here is the A.C.C.C Lawful Notice of Fine below against their constant bullying of me and others here in Victoria Australia. It is an Anti Harassment fine from Canberra, which our Head of Government in Australia had sent me. Please use this as a template to help you all. Please note that you will have to check this with your Head or Heads of Government and Law Department/s to change some of the words to fit in with American and or Canadian Law to make this Lawful. This notice got these FIENDS off my back for good it seems. They only had fourteen days in which to contact me by answer of their letter of dispute with me. They never did contact me with any reply of dispute against my Lawful Anti-Harassment Letter, these I allege to be Truly Evil Electric Power Company C.E.O’s, so you can see that so far I have won using THE LAW ! Please note that the same goes for the Water and Gas Company/s here in Victoria and all States of Australia. Anti-Harassment Notice is next line/s down……. Your Company is prohibited and forbidden from communication in any manner, with the intent to solicit for the installation of a “smart meter” or meter containing wireless communication function(s) at the following (service) address: (Insert your address). Such an act is herein referred to as a PROHIBITED ACT. Any PROHIBITED ACT will be considered an act of undue harassment or coercion with the supply or possible supply of goods or services as defined by the Competition and Consumer Act 2010 (CTH) Vol. 3, Ch. 4, PT> 4-1, Div. 5 Sec. 168; such an offence carries a penalty of $10,000,000 Ten Million Dollars. If Your Company is in any way directed by the Government (State of Victoria) and State of Victoria Corporation to perform such an offence, the Government and individual members are liable under tort may in addition be held vicariously liable. 2. Minister for Energy and Resources Mr Michael O’Brien Victorian Government in the State of Victoria. Consumers are at the mercy of the big utilities. No matter how hard we fight it they will still win. We lose. They have the money and the lawyers and we line their pockets.